Squeeze pits out of plums and peach. Put it all in one pot with about 1 cup of water and cook slowly for about an hour. Take out the cinnamon stick and then let it cool. You can either then put it through a food processor or put an immersion blender in the pot. Serve cold. Great on hot days. Categories: Recipes | Tags: cold soup, fruit soup, Joan's fruit soup, non-dairy, soup, vegetarian | Permalink. Dice the peppers. Mix the peppers with the corn, add salt, pepper and mayonnaise to taste. Categories: Recipes | Tags: corn, corn salad, dill, non-dairy, salad, vegetarian | Permalink. Categories: Recipes | Tags: chick peas, cranberries, non-dairy, raisins, vegetarian | Permalink. Place all ingredients into food processor and blend until creamy. You may alter the measurements of the lemon juice, oil oil and tahina to suit your taste. Pour into serving dish. Put an indentation into the middle and add approximately two teaspoons of olive oil and sprinkle zatar or paprika over the oil. #3 After blending other ingredients add 1/3 cup of roasted pine nuts (roast at 350 degrees on a cookie sheet and watch – they burn easily). Then put into serving dish, make indentation, add oil, and put more roasted pine nuts on top. 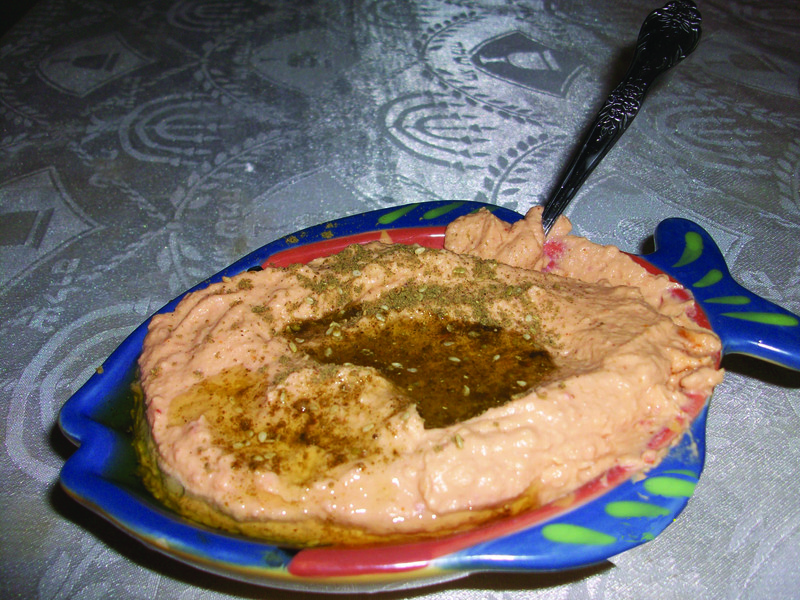 Categories: Recipes | Tags: chickpeas, chumus, humus, non-dairy, vegetarian | Permalink. Categories: Recipes | Tags: cabbage, fish, non-dairy, Stir fried cabbage with fish, vegetarian | Permalink. Mix all ingredients together and then refrigerate Cole slaw. Categories: Recipes | Tags: cabbage, Cole slaw, non-dairy, salad, vegetarian | Permalink. Peel sweet potatoes and carrots and cut into large slices. Cut onion in four pieces. Put the vegetables into the water along with the bouillon and cook for about 20 minutes. Place immersion blender into soup and blend well. If there are still asparagus strings (and that bothers you), then put soup through strainer. Sweet potatoes and carrots make the soup slightly sweet. If you want the soup to have a kick, use the larger amount of spices above, if not then use the smaller amount. Just before serving, throw in a handful of peanuts for some protein and crunch. Categories: Recipes | Tags: non-dairy, peanuts, soup, vegetarian | Permalink.